Recently inducted into the Seattle Jazz Hall of Fame, internationally recognized producer and multi-instrumentalist Amy Denio has laid a new egg in the next of her label Spoot Music! 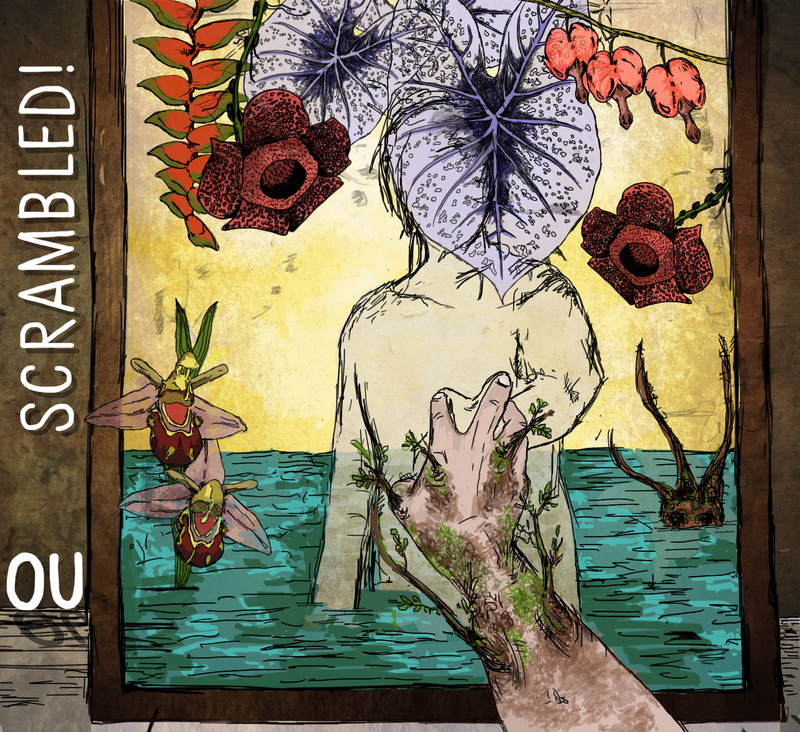 ‘SCRAMBLED!’ is the second recording by OU (‘egg’ in Sardinian dialect), a lively Sardinian/Italian world music sextet based in Rome. This absolutely beautiful collection of new compositions by trumpetist/ukeleleist Ersilia Prosperi is published by Amy’s label Spoot Music, and distributed in collaboration with Public Eyesore Records. Sung in Italian, Sardinian, Spanish, Portuguese, French, English and Pygmy, with a guest brass band and guest chorus, ‘SCRAMBLED’ blurs the boundaries between jazz, world music, irony, ferocity and tenderness. A joyous romping bassline provides the foundation for this battle between logic and habit, romanticism and hilarity. Featuring solos by Andrea Pesce on piano and Amy Denio on clarinet. The egg gets down and gets funky! Performed with expanded horn section and ‘preacher’ Keni Cohen describing the world through the eyes of a hard-boiled egg. In English and Sardinian. A dialogue between gentle and ferocious, from anthemic jazz to the wild abandon of energetic rumba. In Spanish. Composed by Amy Denio and based on Mexican rhythm ‘son jarocho’, this whimsical song evokes the beauty of dissonance. In English. Featuring Ersilia on ukulele, this rhythmic piece mixes the tenderness of a lullabye with the passion of tango, and echoes of Weimar Germany. In Portuguese. Commencing with the abandon of samba, then moving forward with the tick-tock of minimalism, this composition is a tribute to the deep love and respect between OU and producer Amy Denio, inspired by their wild adventures on the road. In Italian. Featuring Denio on Jew’s Harp, this piece is destined to be an underground disco classic! A tender, evocative illustration about the beauty and illusion of love. Featuring Denio on clarinet. Sung in English. A wistful song about ups and downs transforms into mesmerizing and gorgeous trance music. Sung in Spanish and Pygmy.